The Russian revolution of 1917 was a defining event of the twentieth century, and its achievements and failures remain controversial in the twenty-first. 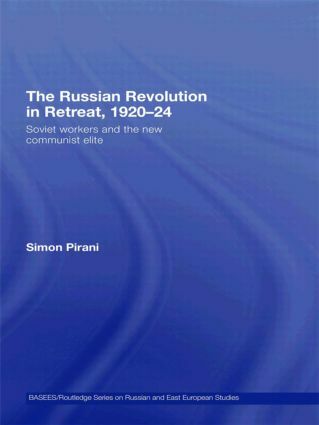 This book focuses on the retreat from the revolution’s aims in 1920–24, after the civil war and at the start of the New Economic Policy – and specifically, on the turbulent relationship between the working class and the Communist Party in those years. It is based on extensive original research of the actions and reactions of the party leadership and ranks, of dissidents and members of other parties, and of trade union activists and ordinary factory workers. It discusses working-class collective action before, during and after the crisis of 1921, when the Bolsheviks were confronted by the revolt at the Kronshtadt naval base and other protest movements. This book argues that the working class was politically expropriated by the Bolshevik party, as democratic bodies such as soviets and factory committees were deprived of decision-making power; it examines how the new Soviet ruling class began to take shape. It shows how some worker activists concluded that the principles of 1917 had been betrayed, while others accepted a social contract, under which workers were assured of improvements in living standards in exchange for increased labour discipline and productivity, and a surrender of political power to the party.